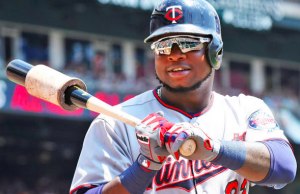 Minnesota Twins third baseman Miguel Sano has been accused of sexual assault. Betsy Bissen, a photographer, made the accusation on Twitter Thursday as part of the #MeToo movement. Bissen previously took photographs at Twins games and currently works for the St. Paul Saints, an independent baseball team. She says the incident with Sano took place at a mall following an autograph session in 2015. In her Twitter post, Bissen says that Sano barbed her by the wrist and pulled her into a mall bathroom. She says she resisted but couldn’t break away from the much larger Sano, who’s listed at 6’4” and 240 lbs. Bissen says that after 10 minutes of trying to fight off Sano’s unwanted advances, telling him no, and him trying to pull her into the bathroom, he finally let her go. Rob Plummer, Sano’s agent at the time, says he was at the mall during the autograph session that day. However, he says he was outside the mall waiting for Sano to join him in the car at the time of the incident. Plummer says he did not see Sano pulling Blissen toward the bathroom. Sano was quick to release a statement refuting Bissen’s claims. Of course, an investigation will be conducted and Sano could face punishment from MLB. Previously, players like Aroldis Chapman, Jose Reyes, and Jeurys Familia have all been suspended for allegations of domestic violence. It’s likely that the league will treat allegations of sexual assault just as seriously. There is no minimum or maximum penalty that MLB can impose for such an offense. Sano was arguably Minnesota’s best offensive player in 2017. The 24-year old hit .264 with an OPS of .859. He was also selected to the All-Star Team for the first time in his career. He figures to be an important part of the Twins moving forward. It remains unclear if this incident could derail his career or have significant consequences down the line. Only time will tell. Meanwhile, Bissen should be commended for coming forward and sharing her story publicly.